LIBERTY, NY (September 8, 2014) — Are you overwhelming in fresh veggies? Are your tomatoes begging to be preserved? Too many beans, peas, carrots? A workshop on home food preservation using the hot water bath method is being offered on Saturday, September 27 from 11:00 a.m. to 1:00 p.m.
Cornell Cooperative Extension Sullivan County (CCESC) will hold this introductory class on the fundamentals of canning in its new Entrepreneurial & Teaching (EaT) Kitchen. The Eat Kitchen is located at the CCESC Gerald J. Skoda Extension Education Center on 64 Ferndale-Loomis Road in Liberty. 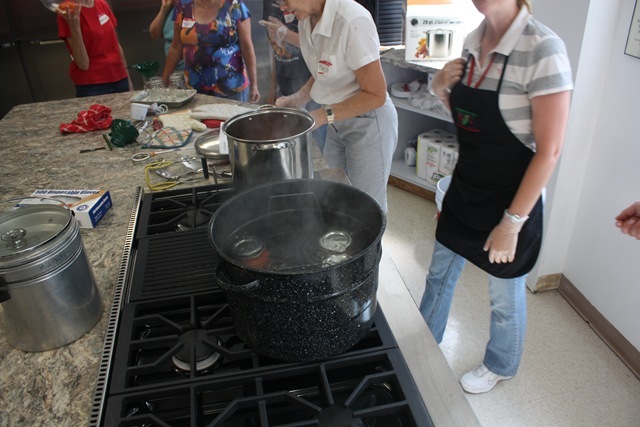 Master Food Preservers, SueAnn Boyd and Jessica Gibbons, will teach how and when “hot pack” is preferable, basic canning safety, and the proper hot water bath canning procedure. Participants will take a prepared food sample home. Pre-registration with non-refundable payment of $25.00 is required in advance. Registration and more information can be obtained by calling CCESC at 845-292-6180 or emailing SueAnn Boyd at srb46@cornell.edu.